Living memorials are part of a growing (!!) trend towards honoring the life of a departed loved one by emphasizing life, rather than death. The idea is to shift the focus away from death and towards a celebration of their life as it lives on in the memories of their friends and family. This is why many families now prefer to conduct “life celebration” events which feel more like a party than a memorial service, use eco-friendly and biodegradable caskets or urns, and will even use the ashes after cremation to plant a living tree. For the memorial you’re planning, whether it be for yourself in the future or for a loved one now, you can incorporate as much or as little as you like of the “life celebration” idea into the service. 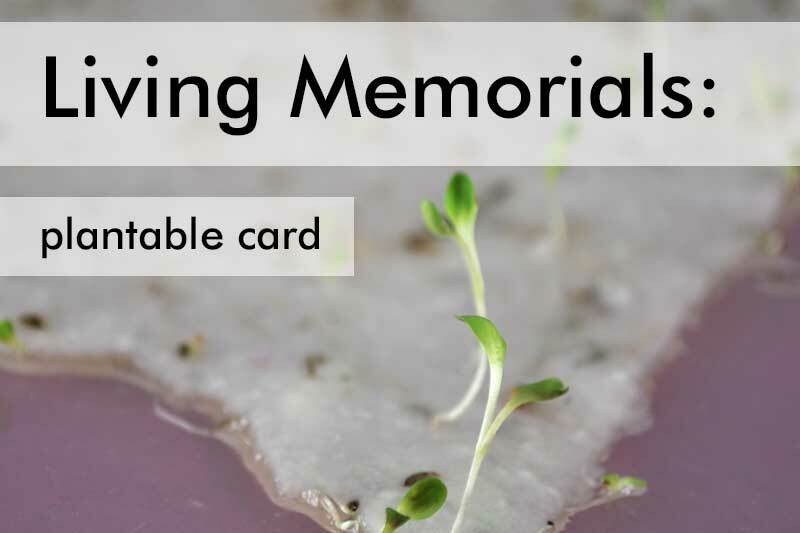 Living memorials provide a great way to sprinkle this idea of celebrating life into the funeral or memorial service, and also work wonderfully as memorial gifts to send when you can’t make it to the funeral. 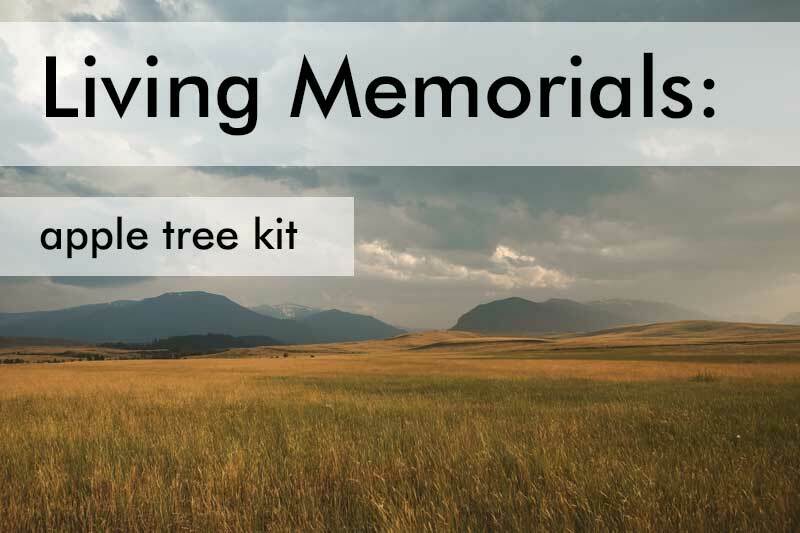 Here are are 11 of our favorite “Living Memorial” ideas to honor a loved one. This post may contain affiliate links, in which we may receive a commission should you purchase something we recommend. See our full dislosure here. 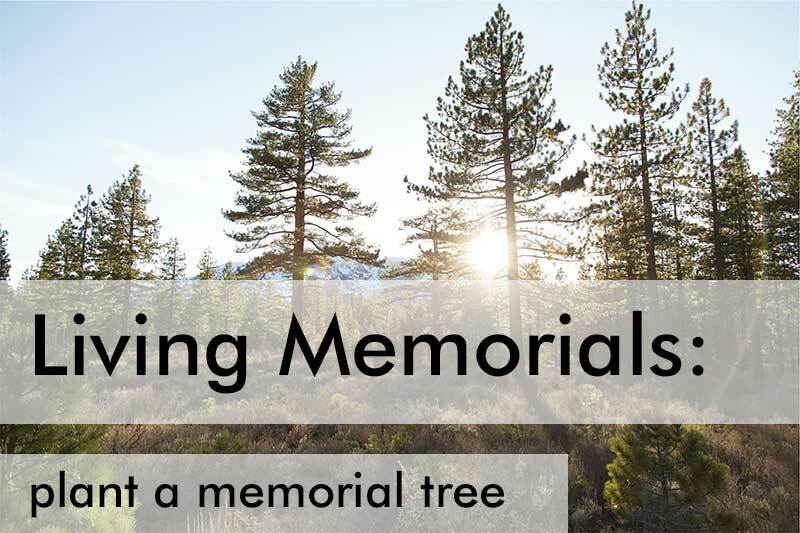 Planting a tree to honor your loved one’s memory is a beautiful way to “give back” to the environment while establishing a living memorial that you can visit. If your loved one is buried far away from where you live, or if you scattered their remains at sea, you can planting a memorial tree establishes a physical location to which you can go to grieve, remember, pray, meditate, leave/plant flowers, and so on. 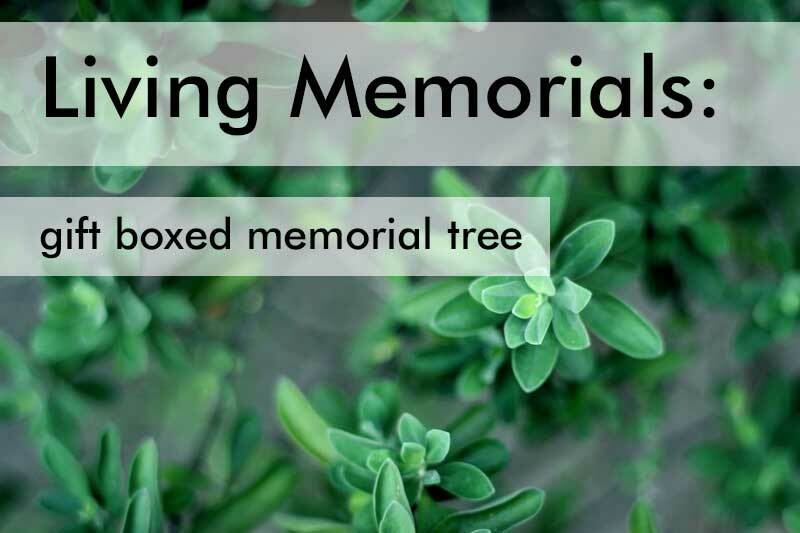 There are many ways to incorporate a memorial tree into the memorial or life celebration service. If you are scattering the remains in just about any outdoor location (lake, stream, forest, part, etc), you can almost always find a nearby place to plant a tree. If the burial has already taken place, or if it is in a different location where many friends and family cannot attend, or if you are keeping the cremated remains at home or in a niche, then the planting of a tree can become the centerpiece of the memorial service, and does great in helping focus everyone’s thoughts on celebrating life. Just be sure to check with whoever manages the land, not only for permission but also to ensure that the type of tree you are planting will work for that particular area. You can find many beautiful memorial trees here which you can purchase and plant yourself. Also, there are many organizations which will plant the tree for you – for example, Trees for a Change will plant one or more trees in memory of your loved one, and send you (or a friend) a lovely certificate indicating where and when they were planted. This is a truly eco-friendly gift because the trees are planted in areas of the United States National Forests that have been ravaged by wildfires, so you know that the tree will be doing good for the environment. 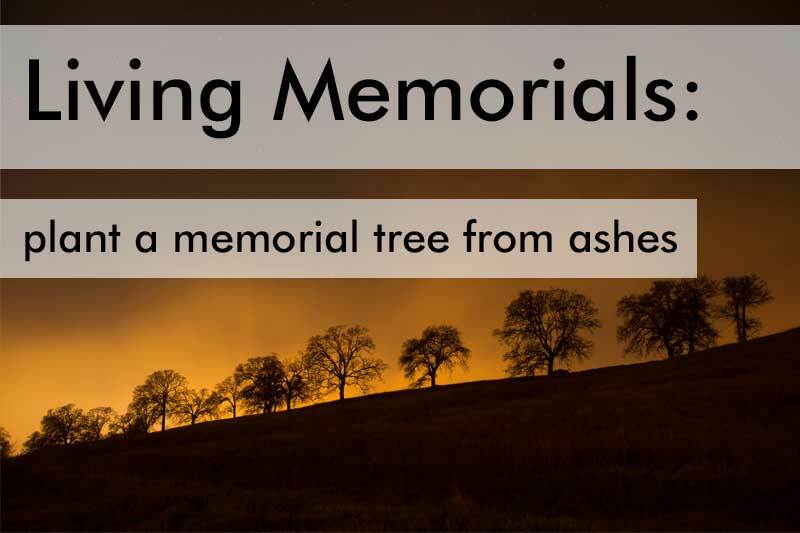 Planting a tree from ashes is an incredibly popular tribute to a loved one, which creates a living memorial that incorporates the remains in the growing process. Many tree types are available, and there is even a choose-your-own-seeds option. Read more about memorial trees here. This can be a poignant and meaningful part of any outdoor memorial service; attendees can participate by helping cover the urn with a small spade of earth, or perhaps scatter flower petals after the planting is complete. 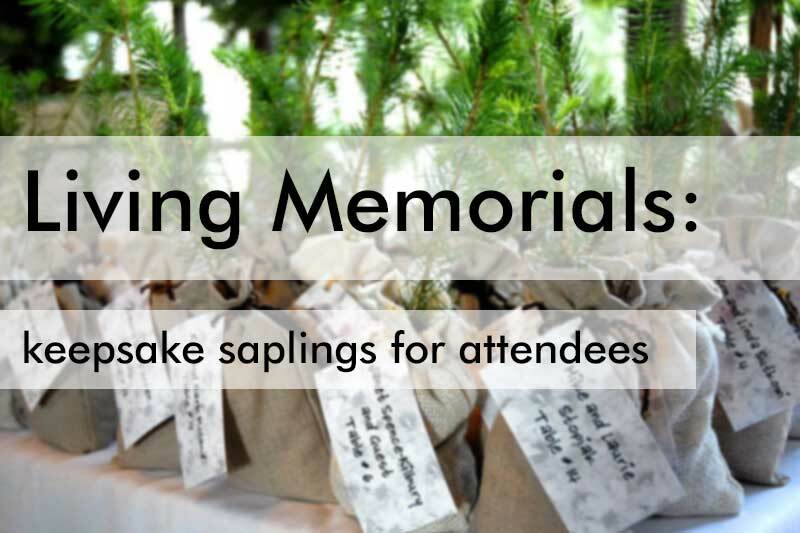 As both a keepsake and a thank-you gift for memorial service attendees, give all comers a sapling in an earthy and attractive burlap bag. 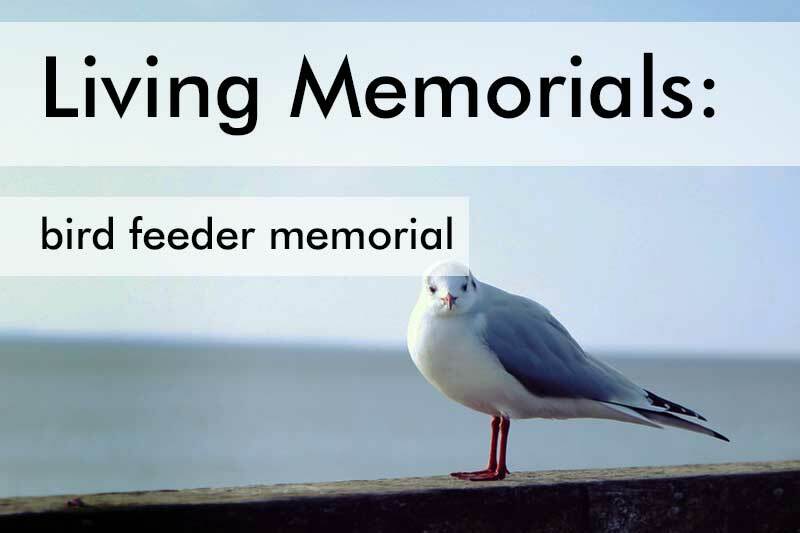 These living memorials will then be spread far and wide to honor your loved one. Beautiful eco-tree seedlings favors are available here, attractively packaged with optional personalized tags. It has become something of a funeral tradition to give small keepsake tokens to attendees at the memorial service. These can be heart-shaped pewter charms, photo buttons or pins, car window decals, custom engraved bookmarks, and much more. 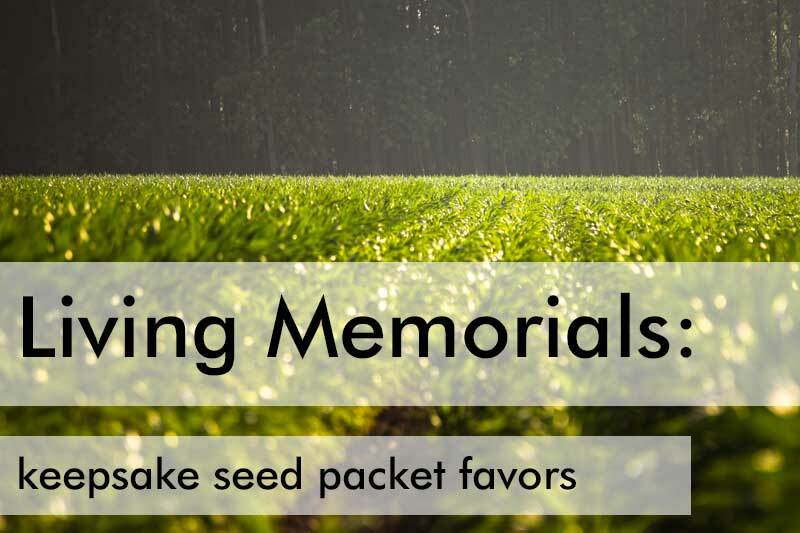 There are also several options for Living Memorial funeral favors, of which Keespake Seed Packets are one of the most popular. You can simply give out packets of the decedent’s favorite flowers, or go with the fitting idea of “Forget Me Not,” or have something a little more personalized like these customizable seed packets, which can include photos and more. 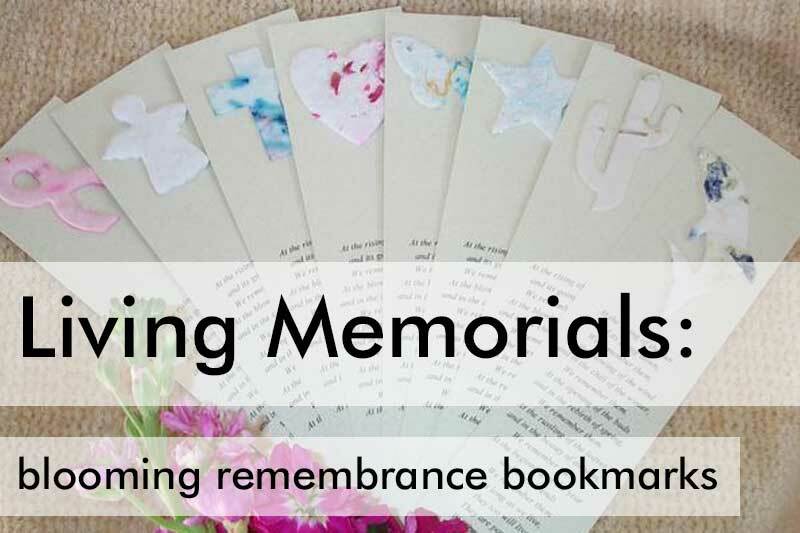 These Blooming Remembrance Bookmarks are a double keepsake. Each attendee will receive a bookmark with a poem, quote, or other text imprinted on it, and each bookmark has a plantable blooming favor attached in your choice of shape. This way each atendee can plant wildflowers as a living memorial, then keep the bookmark as a token reminder of your loved one each time they open a book. 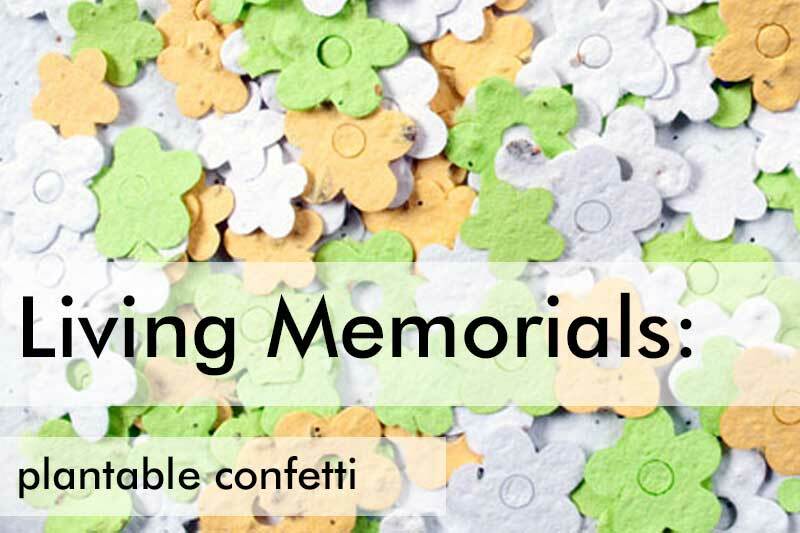 If the memorial event is taking place outdoors, consider plantable confetti as the “living memorial” element in the service. This is confetti made from plantable paper, which is designed to be strewn about in a celebratory style so that it can grow into wildflowers to celebrate the life of your loved one. Available in a variety of colors and styles here, here, and here. This is the one item on this list that doesn’t actually grow. Still, a gorgeous cedar wood bird feeder is a life-celebrating gift which provides sustenance to wildlife in honor of your loved one. Feed and nourish local birds by providing a food source, which will help allow wildlife to flourish around your home and give a sense of comfort and joy. The front acrylic panel includes can be custom engraved with any text or image, or you can choose one of many pre-formatted themes such as sailing, horses, butterflies, hunting, Celtic Cross, Army, Navy, etc. and simply add the name and dates. View complete collection here. A living wreath is a wonderful way to send both a sympathy wreath and a living memorial gift. 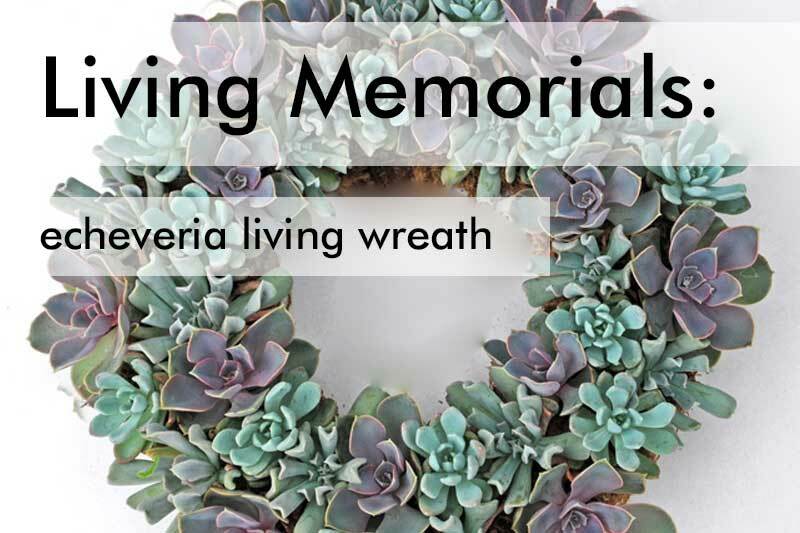 The Echeveria Living Wreath is a certified organic succulent which is grown, harvested, arranged, and shipped from an Oregon Coast wreath store which values sustainable, earth-friendly practices. Can be displayed by hanging or in a saucer or plate on a table or counter for a long-lasting living memorial wreath. The Apple Tree-to-Be Kit is a fun and creative gift that will keep on giving as it grows and becomes a source of delicious apples. An unique living memorial tribute for a loved one’s family, especially for someone who loved apples. Hello I really Love and enjoy your Ideas , Thank You Kindly , Minister , Carrie L. Hayes. Bless You !